By combining micro-imprinting and electro-spinning techniques, researchers at Shanghai University’s Rapid Manufacturing Engineering Center have developed a vascular graft composed of three layers for the first time. This tri-layered composite has allowed researchers to utilize separate materials that respectively possess mechanical strength and promote new cell growth – a significant problem for existing vascular grafts that have only consisted of a single or double layer. Vascular grafts are surgically attached to an obstructed or otherwise unhealthy blood vessel to permanently redirect blood flow, such as in coronary bypass surgery. Traditional grafts work by repurposing existing vessels from the patient’s own body or from a suitable donor. However, these sources are often insufficient for a patient’s needs because of the limited supply in a patient’s body, and may be afflicted by the same underlying conditions that necessitate the graft in the first place. Accordingly, there has been a great deal of research towards developing synthetic vessels that can mimic natural ones, allowing new cells to grow around them and then degrade away, thereby creating new vessels. “The composite vascular grafts could be better candidates for blood vessel repair,” said Yuanyuan Liu, an associate professor at the Rapid Manufacturing Engineering Center. 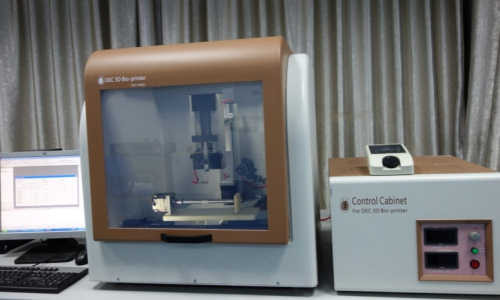 Liu’s team had previously worked with bone scaffolds, which are used to repair bone defects, before turning their attention to cardiovascular disease, and thus vascular grafts. They describe their current research in the journal AIP Advances, from AIP Publishing. As a rule, surrogate scaffolds need to mimic the natural vasculature of their targeted tissue as much as possible. For blood vessel surrogates, this structural mimicry can be fabricated by electrospinning, a process which uses an electrical charge to draw liquid inputs – here a mixture of chitosan and polyvinyl alcohol – into incredibly fine fibers. Electrospinning also allows for a high surface-to-volume ratio of nanofibers, providing ample space for host cells to grow and connect. These components all naturally degrade within six months to a year, leaving behind a new, intact blood vessel. The resulting structure, however, isn’t very rigid – the fly in the ointment for many previous models. To compensate for this, the researchers designed a three-layer model, in which the mixture was electrospun onto both sides of a microimprinted middle layer of poly-p-dioxanone, a biodegradable polymer commonly used in biomedical applications. The ends of this sheet were then folded and attached to make a tube-like vessel. Liu and her team then seeded the scaffold with rat fibroblast cells, which are ideal candidates because of their ease of cultivation and quick growth rate, to test the scaffold’s efficacy in promoting cellular expansion and integration. The researchers found that the cells on these composite scaffolds proliferated quickly, likely due to the functional amino and hydroxyl groups introduced by the chitosan. While a good deal of work remains before the prospect of human trials, Liu and her group are optimistic about the future of their research. Their next project is to test the implants in an animal model, to observe the structure’s efficacy with live vascular cells. The above story is based on materials provided by Shanghai University.